If you’re thinking about engaging me, then you probably have some questions about my services. Below, you can find some common questions I get from potential clients. If you can’t find the information you need on this website, please get in touch. How much does it cost to hire Stephan? It’s impossible to give you an accurate estimate without knowing the complexity of the project. That said, I can tell you that my services are not cheap!I’m not here to provide quick fixes. If you’re ready to make a serious investment, you’ll see serious results. If you need proof, I’m happy to put you in touch with my previous clients who have seen what I can do first hand. SEO means I get organic traffic for free, so why do I need to pay Stephan a monthly retainer? In one sense—that you don’t have to pay for clicks—SEO is free. But maintaining your Google rankings does take work. If you’re not prepared to set aside a budget and resources for SEO, then you might be better off sticking to paid advertising.In the long term, an investment in SEO will be cheaper. And, my aim is to coach my clients so they can optimize their sites themselves. We only have a small budget. Can you help us rank in Google and increase sales, and we’ll pay you when we start to see results? If you’re not willing to set aside a serious budget for SEO, perhaps you’re not ready for success with your online business. I get emails from SEO companies offering to help me rank in Google all the time, and they’re much cheaper than Stephan. Why shouldn’t I go with them? What does it tell you if an SEO company is cold emailing you to rustle up some business?For one thing, they’re not very good at their job! Otherwise they’d be drowning in leads due to all the referrals they would receive from clients who rank #1 in Google. So, go ahead and hire them. But don’t say I didn’t warn you! I already pay for AdWords, why would I invest in SEO? If you could magically get traffic to your website for free, that would be great. Unfortunately, there are always going to be costs involved in running a website. Whether that means regularly producing content, paying for advertising, or investing in SEO; time, energy, and money are needed to stay competitive. That said, an effective SEO strategy can increase your sales and reduce your ad spend over time. Why are your services so expensive? Wouldn’t we be better off investing that money in other types of marketing? SEO is a central part of your marketing mix, like email marketing, PPC, or TV. The important thing is not how much you spend, but that you get the mix right, and achieve a return on your investment.If you’re concerned about the cost of my services, I’m happy to put you in touch with previous clients who can share their experiences. Shouldn’t I wait until I’ve sorted out the other problems with my business before I spend money on something like SEO? There‘s no reason why you can’t do both. In fact, developing an SEO strategy raises some key questions about your core business, who your customers are, and how you go about your marketing. And it can help you solve many problems both offline and online. Doesn’t everything happen on social media these days? No one cares about my website. I have a big following on Facebook/Instagram, so why should I invest in SEO? Social media is vitally important to any marketing strategy. However, the fact is, most transactions still happen outside of social media—usually on a website.If you rely on one social media site for traffic and conversions, you’re putting all your eggs in one basket. A good SEO strategy will help you draw on traffic from a range of sources, minimizing your risk of being left high and dry. If you want to get traffic to your website, and customers to buy your products online, then SEO is vitally important. Without it, you either won’t get found, or you’ll get found by the wrong people. Can’t I just teach myself SEO? Sure. There are plenty of resources online to learn the basics. I’ve been in the business for several decades; so if you want advice on what really works, get in touch!I also offer SEO coaching services. However, there are some minimum skill requirements, so contact me before you sign up. Stephan is just one person, but I need a full service agency. How will I manage the implementation? Sometimes, my clients can easily manage the implementation themselves, with a little guidance. Other times, they need help. While I am just one person, I also have a crack team of writers, developers, and designers at my disposal whom you can count on to get the job done. What are the most common SEO problems? Can Stephan just tell me what’s wrong with my website so I can fix it myself? Absolutely! The first thing I do is a technical analysis of your site. Then, I’ll provide you with a list of recommendations, and we can chat about the implementation. If you feel that you and your team can handle the work internally, that’s great. I’ll be there to provide guidance and further recommendations where needed. Can I talk to Stephan’s previous clients to make sure he did what you claim? Sure! Just drop me a line. We have a pretty good marketing strategy already. What would SEO add to that? If you’re a cookie company and you don’t show up in Google for cookie-related terms, then you are missing out on A LOT of customers. If you think your other marketing efforts make up for that, then that’s great. But for most companies, they don’t. SEO can always add something to the mix. We’re a non-profit. Do you do pro-bono work for charities? I try and give back the community in many ways. Get in touch, and we can talk about your needs. I see that you’ve done some work for my competitor. Would it be a conflict of interest to work with me if I want to rank for the same keywords? While you may be directly competing with a company I’ve worked with to rank in Google, no two businesses are exactly the same. In fact, the keywords you need to target may be completely different. I’m not a technical person. How can I be sure it’s not all smoke and mirrors? I’ll explain everything I recommend in layman’s terms, or, I’m happy to work with a developer or marketing person who is technically minded. When it comes down to it, even the most technical aspects of SEO can be explained in simple terms. We’re working with an SEO company who promises we can rank on page 1 for term “X”. Can you make the same guarantee? The best keywords aren’t always the most obvious. For example, if you’re a donut shop, you might think that you want to rank for the term “chocolate donut.” Good keyword research can reveal what your customers might really be searching for, for example “where can I buy donut holes right now.”Sometimes, trying to rank for the most popular or obvious term can be a waste of time and money. I can help you scour the web for keyword opportunities that your competitors may be missing. I’ve helped many clients uncover an untapped keyword niche that’s ripe for the mining. There’s something wrong with my website, but I don’t know what it is. Can you help me fix it? Absolutely! The first thing I do when taking on a new client is a deep-dive audit on their website. I then provide you with a list of actionable recommendations to fix any issues. Why can’t I just leave SEO to my web developer/IT department? While your developer or IT department might understand the basics of SEO, it’s not all technical. A large part of a successful SEO strategy is creating fresh, engaging content. An SEO professional ideally will have a grasp on both the technical aspects of web development, and the more creative aspects of marketing. Needless to say, this skill set is rare! We’re a huge brand with massive brand awareness. Google will give us the number 1 spot automatically, so why should we care about SEO? Even if you’re a huge brand making a ton of money online, there are always opportunities to make more! Why rest on your laurels when you could be dominating your competitors? My WordPress plugin/CMS does SEO automatically. Why would I pay someone to do it? WordPress plugins can be great for automating tasks, and making website maintenance more efficient. However, if you rely on plugins alone, your SEO strategy will ultimately fail. SEO takes an investment of time, money, and resources to maintain your rankings. How long is it going to take to get my site ranking in Google for my preferred keyword? Google is a strange beast, so there are a number of factors to consider when estimating the time it will take to rank. One thing I can say is that results are not often achieved overnight—especially if you want to secure your rankings for the long term.Once I’ve completed an analysis of the opportunities for your site, I’ll provide an honest assessment of how long it will take to achieve your goals. Once my site is optimized, I don’t need to do anything else, right? Wrong! 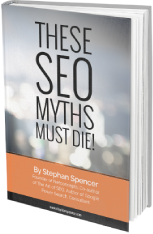 When it comes to SEO, this is one of the biggest misconceptions out there. Like any marketing initiative, maintaining your Google rankings means constant tweaking, testing, research, and of course, regular updates with fresh, engaging content.If you’re not prepared to set aside a monthly budget for this work, then your SEO strategy is bound to fail. I just set up my brand new website. How long will it take to rank in Google? That’s great. Starting from scratch means you have the opportunity to get things right the first time. Without seeing the site, it’s hard to know exactly how long it will take to rank in Google. I’ll work with you to provide a roadmap for your online success. Can SEO really increase my online sales? Absolutely! I’ll create a strategy that’s fine-tuned to target the specific people looking to buy your product. With the wealth of analytics data available to marketers these days, it’s possible to understand your customers like never before—and give them everything they’re looking for! Why should I hire Stephan and not the other SEO consultants I’ve seen online? I’ve been in the internet game since the 1990s. I’ve not only watched SEO consultants come and go, but I’ve learned through experience what works, and what doesn’t. I’ve even published a book on the topic! When I make a recommendation, I don’t sugar coat it. I’ll tell you how much it will cost, how long it will take, and how much hard work you’ll have to put in to achieve it. In the end, it’s all about results—and my results speak for themselves. On average, what kind of increase in traffic/sales do your clients see? Again, this depends on a lot of factors. If you’d like more information on how I’ve helped specific clients, I’m happy to talk you through previous projects. I can also put you in touch with clients who will discuss their successes with you. How long until I start to see a return on investment? The truth is, it often takes several months to start seeing results from SEO strategies. This may seem like a long time—especially when compared to other marketing initiatives—but you’re often dealing with complex variables, and a lot of competition.Beware of consultants who tell you they can achieve fast results. They may deliver, but in the long term you—and your ROI—will suffer. I hired an SEO consultant and it didn’t do anything for my website or my business. Why do I need to take a course in it? I’m sorry to say that there are fly-by-night SEO firms out there. Some of them promise you the world, only to deliver rankings that disappear a few months later. This is not how SEO should work at all!Every website owner should have a basic understanding of SEO, especially if you want to get your content seen. Otherwise, you’re flying blind. I already know how to code. Why do I need to take a course to learn how to audit my website? Knowing how to code is a huge advantage in the SEO world. However, there is much more to Google rankings than good code. A big part of SEO is developing a coherent content strategy that gets you attention and links, and keeps your audience engaged. While I do cover some technical elements in this course, there is plenty to learn about online marketing too! I taught myself how to use Google Search Console. What more do I need to know? Google Search Console is a very useful tool, and all website owners should sign up for it. As an SEO, I’ve been using Google Search Console practically since it was introduced (as Google Webmaster Tools) many years ago. While the basics are relatively easy to grasp, there are some powerful tricks and features that only an expert can teach you how to leverage properly. What is Screaming Frog, and why do I need to know how to use it? Screaming Frog is a tool that allows you to analyze your website for problems that may affect your Google rankings, as well as the overall performance of your site. Even if you do not sign up for my course, I suggest that you download and run it on every website you own. If you’re seriously interested in attracting quality, organic traffic to your website, then it is a very useful tool. Why would I do a course that just tells me how to fix broken links on my website? It’s true that broken links are bad, and can definitely affect the performance of your website. However, SEO is a complex discipline, and there are many reasons why a site might not be ranking. Every website owner should have at least a basic understanding of how to diagnose and solve these issues. Otherwise, you’re letting sales slip through your fingers! My website loads fast enough. Why do I need to learn about page speed? While it may look as if your page loads quickly, there are many underlying factors that are invisible to the untrained eye. Since page speed is a key “signal” that Google uses to make decisions about what pages rank, understanding it in detail is vital. I already have good content. Won’t Google just figure out what my site’s about automatically? Good content is one thing, but there are many factors to consider—is it organized in a way that makes it easy for Google to understand? Can your users find what they need quickly and simply?In this course, I will teach you best practice techniques to boost engagement, and ultimately, sales! I use Google Analytics and it already tells me everything I need to know. Why do I need to use these other programs? Google Analytics is a powerful tool that gives you amazing insight into your users. However, if you really want to beat your competition and uncover new, lucrative opportunities, you’ll need to get your data from a range of sources. A UX professional designed my site and it looks fine to me. Why do I need to audit it? While there are many skilled UX professionals who can provide valuable advice, they hail from all sorts of backgrounds—and many of them have no understanding of Google’s search algorithms.I’ve been in the online marketing game since the 90s. Over the years I’ve watched Google’s algorithm evolve. This course will teach you what works, and what doesn’t when it comes to designing for both your customers and the search engines that bring them to your site. There’s something wrong with my site, and I don’t know what it is. Will this course help me figure it out? Absolutely! Every website owner should have the basic diagnostic skills to understand why Google is penalizing their website. For many people, this course has proved invaluable, allowing them to avoid lost revenue and expensive consultants. I’m not a technical person. All of this is going over my head. Is your course easy to understand for beginners? My course is designed to cater to people with all levels of technical knowledge. And remember, SEO is not just about coding—there are plenty of other factors to consider when seeking Google rankings for your site. Will this course help me make more money from my website? If you follow my advice, there’s no reason why you can’t transform your website into a thriving, money making machine! How much does the SEO Audit Course cost? The course costs $4997.00. That may sound like a lot, but most people find that once they get the traffic flowing to their sites, the return on investment comes in quickly! How long does the SEO Audit Course take? The course includes six modules and about 10 hours of video tutorials. Most people find that they complete the course in about three days. However, you can take as long as you need. So, this course will help me diagnose the problem with my website. But what if I don’t know how to fix it? This course will absolutely teach you to diagnose the most common problems that may be keeping you from ranking in Google searches. Not only that, but it will go into detail—with plenty of examples—on how to actually fix those problems.If you’re still having trouble, I’m happy to provide guidance on where you’re going wrong. My WordPress site/CMS has and SEO plugin that automatically optimizes my site. Why do I need to do a manual audit? While SEO plugins are certainly useful, on their own they are no match for a manual website audit, deep keyword research, and a well-thought out strategy that’s tailored to your niche. Sounds interesting, but how will this course really benefit my business? If you’re interested in getting more organic traffic to your website, higher conversion rates, more online sales, and lower PPC advertising costs, then this course can definitely benefit your business! I’ve done SEO courses before, and I didn’t really see the value in it. Will this course be any different? There are many SEO courses on the market. Some of them are good. Some of them are not so good. Where many courses fail is in their ability to present complex technical information in a straightforward manner.I present each step in an easily digestible, bite-size chunk of information so that you don’t get lost. Of course, if you find yourself overwhelmed, I’m happy to provide you with a little guidance to get you back on track. I noticed that the course is mostly video content. If I have a question that’s not covered in the video, can I contact you directly? Of course! I’m happy to answer any questions you have. Will this course teach me everything I need to know about ranking #1 on Google? The course covers some of the most common issues that stop businesses from ranking in Google. If you put the work in, and do everything properly, there’s no reason why you can’t rank #1 in Google.However, SEO isn’t just about the number one ranking. It’s about using data to develop insights into your market, and then leveraging opportunities to get the edge over your competitors. Will this course help me find the reason why my site has low traffic? There are many reasons why your site might have low traffic. This course introduces the most common SEO problems, and gives advice on how to fix them. If you still can’t solve your traffic problem, get in touch! I’m happy to provide further advice where needed. My site has been penalized by Google. Will this help me fix the problem? Yes! You will learn the main reasons that Google penalizes websites, and how to recover from them. I’m not sure I have time to take this course. Can I just hire Stephan to audit my website? My brand is huge, and Google loves us. Why would I waste time on an audit? If you don’t think there’s any room to increase your traffic, or improve your online sales and conversions, then that’s great. But, I can tell you that I’ve worked with some pretty huge brands on some very large sites, and there is almost always room for improvement. Why do I need to worry about backlinks? We have great content, so people will link to our site anyway. Honestly, I’ve seen plenty of sites with amazing content that languish deep in the back pages of Google. Content is a key part of your SEO strategy. However, you can’t just upload it and expect people to find it. This course will give you the basic tools to gain Google rankings and get your content in front of your customers. I have a developer/IT department. Can’t they take care of this? While there are many technical aspects to ensuring your website is Google-friendly, there are also many other non-technical considerations. For example, would you want your IT department advising your marketing department on their online content strategy? Probably not! This course provides a basic overview of SEO techniques and is easily understandable without a technical background. How long does it usually take to audit a website? That all depends on the size of the website, and the complexity of the issues it may have. An audit could take a couple of hours, or it could take weeks if there is an underlying issue that is not immediately apparent. I get a lot of emails from SEO companies offering to do an audit on my website. Why should I learn how to do it myself? If an SEO company has to send out cold emails to find clients, what does it tell you about the company?They’re probably not very good at their job—otherwise they’d have plenty of clients due to their excellent SEO skills. Feel free to hire someone like this, just don’t say I didn’t warn you! If you’re interested in joining my exclusive Mastermind program, you can find a list of commonly asked questions here.